During excavations at Søborg castle a number of swords have been unearthed. Many of these are preserved in the National Museum in Copenhagen. One of them (inventory number D 8801) is an especially fine example of a long bladed knightly sword from the high medieval period. It has a typical straight guard and a well formed brazil nut pommel. 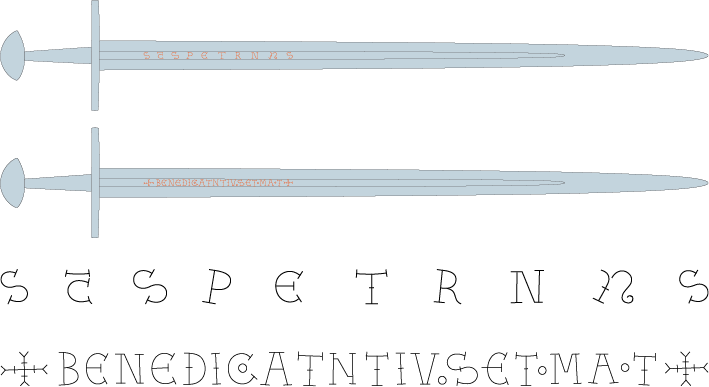 In the fullers on both sides of the blade there are inscriptions inlaid with silver, reading +BENEDICoATNTIVoSEToMAoT+ on the front and S(CT)SPETRN(NU)S on the back. CT and NU are probably abbreviation symbols formed of a combination of letters. The diminutive circles might be abbreviation markers, letters or some other symbols. A number of swords that have inscriptions with very similar letter forms survive in collections in England, Finland, Poland, Germany and Switzerland. Fig.1 Detail of the inscriptions on boths sides of the blade and their placing in the fullers. D 8801 is a weapon of the highest order. It is masterfully made with a clear understanding of function and a fine sense of form and proportions. The lettering in the fullers is cryptic, but part of its meaning can be deciphered. The first part of the inscription is a prayer for blessing from Someone upon Us: the N after BENEDICoAT could indicate “Nos”. The ( …. ) TIoSEToMAoT could be an acronym for a saint (or saints) or religious persona(-s). MA(oT) towards the end might stand for “Mater” or “Maria”. The inscription “SctSPETRNnuS” on the other side seems to be an invocation to Saint Peter, the protector of the Catholic Church. D 8801 was published by Oakeshott in Records of the Medieval Sword as sword XI.3, with a style 1 cross and pommel of type A. He dated it to the period AD 1100-1150 or even as early as AD 1075. 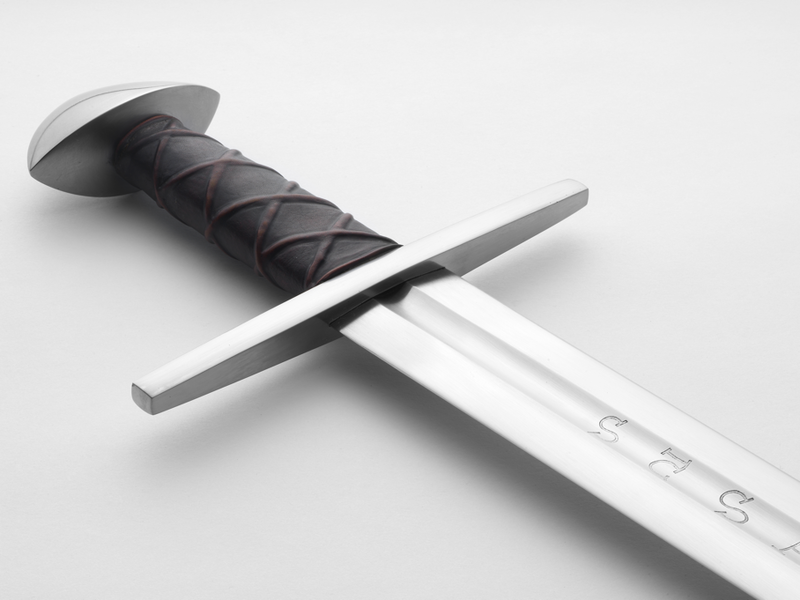 According to Geibig´s classification of medieval swords, the blade conforms to type 9 (a type that was in use during the 12th century) and the hilt is of combination type 16 variant 1 (mid 10th century to the third quarter of the 12th century). A further basis for dating is the inscription that according to Geibig is of a type that is in use from the mid 11th century to the end of 12th century. This suggests a span for dating from around AD 1100 – 1175 for Søborg D 8801, making it contemporary to the dynamic and powerful archbishop Eskil (ca AD 1100 – 1181), who according to legend had Søborg castle built into the most formidable stronghold in 12th century Denmark. This was a period when the political necessities of kings clashed dramatically with the interests of the Holy See. Eskil took active part in the internal conflicts of the kingdom as well as the power struggle within the Church. As a loyal follower of Pope Alexander III, he put the interests of the Catholic church before those of the Danish monarchy. He was also much in favor of the Cistercian order and it expanded its influence in scandinavia during this time period. In its time the sword would have belonged to a man of means and power. It was a weapon that vouched for his martial prowess, his sense of duty as well as his privileges. It did not express its owner´s status through any gold or silver on the hilt but through a stark form that shows a dedication to severe knightly ideals. The inscriptions in the fullers of the Søborg sword makes it clear that it was a weapon intended for a holy purpose and that its owner probably favored the cause of the Catholic church. If we let our imagination have some free rein it is not difficult to imagine that the original owner could have been a man at arms in the service of Archbishop Eskil. The Søborg sword is a large weapon with a total length of 1090 mm. In its present state (with some damage from rust and lacking its grip) it weighs some 1107 grams and would probably originally (complete with a grip) have weighed around 1160 grams. The point of balance is situated at around 16 cm below the guard. An effective distribution of mass gives the Søborg sword a balance that is responsive and smooth. It is made to be used together with a shield in wide powerful cuts and slashes. Fig.2 The dynamic properties of the Søborg sword. The positions of the pivot points in grip and blade is an effect of the rotational inertia of the weapon. Distribution of mass affect the dynamic balance of the sword: it determines how will want to behave in motion. The placing of the node of no vibration in the hilt close to and sightly overlapping the cross suggests that it was sometimes used with the index finger wrapped around the guard (this is also seen in period art of men at arms with swords in their hands). Grasping the sword this way would maximize the effect of the dynamic properties of the weapon and provide good control of the direction of the edge in a cut. The Søborg sword is very well preserved for the most part, with the hard black patina revealing fine details like file marks and scratches remaining in the polish in many places. There is some small loss from rust in the edges in parts but much of the original surface remains. The illustration below (Fig.3) shows the original pencil tracing of hilt and point with the reconstructed outline as an overlay in blue green. For the purpose of analysis, the pommel and the guard have been adjusted to a true perpendicular and centered position, but otherwise not been changed in position, outline, or dimension. Fig.3 Details of hilt and point showing a tracing of the original and the reconstructured outline. Even with some damage from rust (with most corrosion in the point section), the shape of the blade is well represented in both width and thickness and the original outline of the blade can be reconstructed by following the “high spots” with a good degree of certainty. The original blade length would probably have been around 938 mm, give or take one mm or two. The fact that a small part of the original point is missing does introduce a degree of uncertainty in an analysis of the proportions of the sword, but not so much that it effects the outcome in any meaningful way (the difference in the proportion between hilt length and total length is 0,1 percentage between the extremes, accepting a ±2 mm tolerance in estimated blade length). 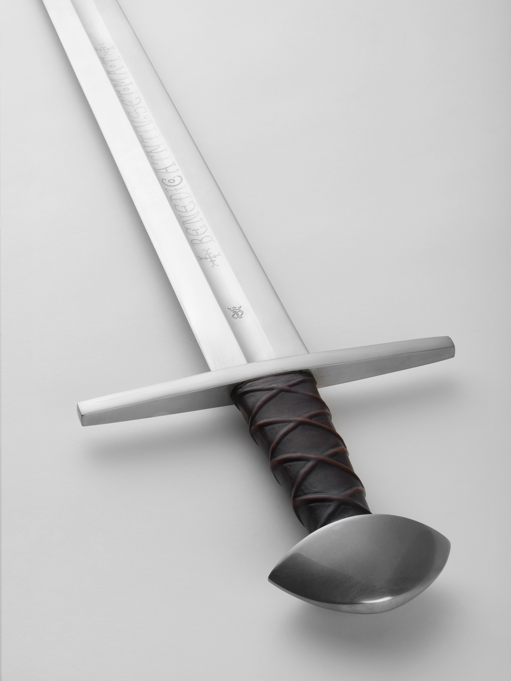 Medieval swords are recognized by their stark simplicity of form and harmonious proportions. Even with irregularities and deviations from the straight and true, their shape suggest that some intentional structure underlies their design. A system of modular proportions is sometimes used, but it is not uncommon that proportions are also based on ratios of irrational numbers such as root numbers and/or the golden section. The intriguing question was to me how these proportions were established without the help of pocket calculators by medieval smiths and sword cutlers. It must have been a method that is both straight forward and practical while at the same time allowing for great subtlety. Since the summer of 2010 more than 80 swords from different time periods have been analyzed, to see if there is a system in their design. An igniting spark to this study was the realization that the shape of D 8801 from Søborg followed a simple and coherent geometric structure. Results so far indicates that weapons especially from the 12th and 13th centuries have proportions that correspond to clear and coherent geometry. My hypothesis is that swords may have been designed according to principles similar to those used by medieval architects, artists and engineers. A construction based on geometric drawing would typically result in the combination of modular proportions and ratios of irrational numbers we see in swords. 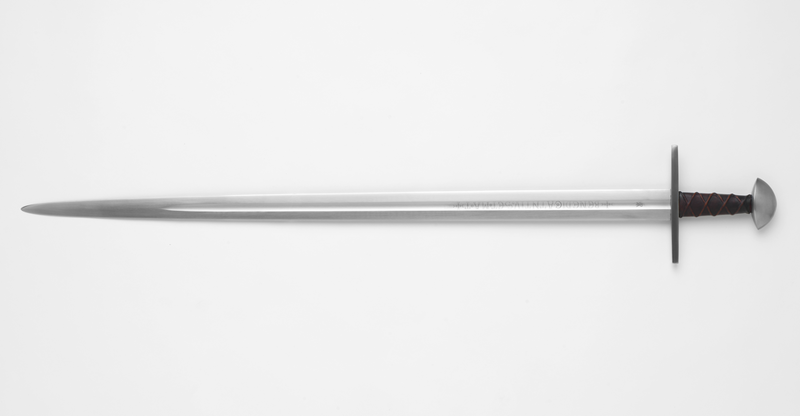 The properties of the proportions of d8801 from Søborg is a useful example for how geometry may have been used in the design of medieval swords. Below the structure is developed in a step-by-step manner. More examples geometric design of swords will be shown in coming articles. There is a heirarchic order to the elements in a geometric design, typically a progression from the general to the details. It is useful to remember the 13th century poet Vinsauf´s words of how a work of this kind is first completed in “the citadel of the mind” before anything is dedicated to drawing. For an introduction to the use of geometry in medieval art please read the article “Higher understanding and deeper reckoning“. (fig.4a) The lay out of the Søborg sword involve ten circles and results in numbers that may be intentional and meaningful for the design. The ten circles (the Commandments) cut the line in 12 points (the apostles), and produce nine vesica forms (Thrice Holy). (fig.4b) A square is constructed around the first circle. This square is a practical device for geometric construction and may also signify the concepts of stability, strength and righteousness. (fig.4c) With the help of the first Vesica an equilateral triangle is perfectly inscribed into the the first circle. The triangle is a common symbol for the Holy Trinity. (fig.4d) Two diagonal lines connect the corners of the square, the corners of the triangle and the end of the line marked by the ten circles. It should be noted that the figure is not mathematically perfect: if drawn to full scale the diagonal lines passes 0.2 millimeter inside the corner of the triangle. Since medieval geometric construction did not involve mathematical calculations a minute discrepancy like this would disappear in the thickness of the lines drawn with ruler and compass on a chalked board or a piece of parchment. The diagonals are not essential to the design but show the harmonious nature of the figure. It may have carried meaning to a medieval draftsman making it a fitting lay out for a knightly sword. (fig.4e) The composition of the line of circles, the square and the triangle defines all at once the proportion between hilt and blade and at the same time gives the width of the guard. (Fig. 5:I-V) The proportions of the hilt and the width of the blade are defined by subdivisions of the first circle and square. (fig.5:II) The top curve of the pommel is defined by a circle that is tangent to the side of the square and diagonals across the square. the vesica and drawn from the middle of the side of the square. (fig.5:IV) The bottom curve of the pommel is defined by a combination of two circles. 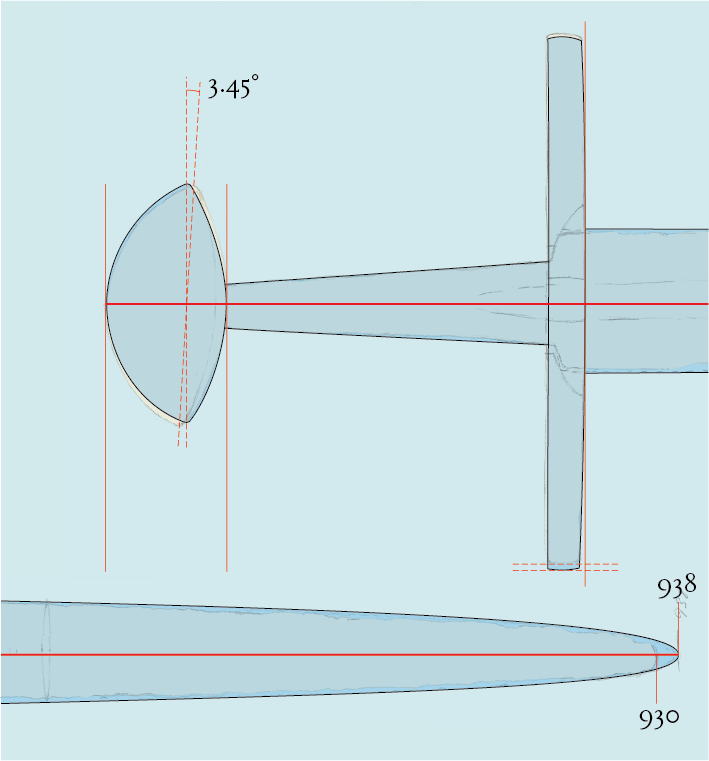 (fig.5:V) blade width is defined by two arcs that are tangent to the circle that helped define the bottom curve of the pommel. These two arcs defines the width of the blade and puts it in the proportion of the golden section to the side of the square. Illustration below (Fig.6) shows how the placing of the guard can be varied while the overall proportions still comply to the geometric structure. In my article in the Park Lane Arms Fair catalogue of 2012 I proposed a solution that defined the exact placing of the guard and at the same time also its height. Since then I have found another approach that is more simple and reasonable. The geometric design that is the basis for the Søborg sword would likely have been used for many swords that share the same proportions even if made to different size. It is more reasonable if the width of the blade is derived independently and directly from the basic circle and square out as shown above (and not depend on the exact location of the guard as I suggested in the Park Lane article). The guard can line up with the vesica with either side or somewhere in between and the proportions would still follow the structure of the design. Fig.6 The guard shown lined up with front edge, middle or back edge alongside the equilateral triangle. All of these variations are possible within the geometric structure. Used this way, the design can be the basis for swords in different size and allow for slightly different grip lengths depending on the personal interest of a customer. For a sword with a total length of the Søborg sword this means a possible variation of the grip length of some 12 mm. It is a feature of this method of vesica based design that the proportion between hilt and blade will relate according to prime numbers, with the hilt always being 3 parts. The Søborg sword has a proportion of 3:19 between hilt and blade (Fig.7 below). The proportion between blade length and hilt can be varied by changing the number of circles in the lay out. For swords of this type of the time period of the Søborg sword it would be very unusual to find swords of the proportions 3:13 (based on a seven circle lay out), but proportions of 3:15 and 3:17 are not outside the norm (Fig.8 below). The components of the hilt of the Søborg sword are naturally not perfectly symmetrical, but even so they meet the geometric overlay within small tolerances. The guard of the sword is 170 mm wide. If the geometric structure is made to full scale according to a blade length of 938 mm, the side of the equilateral triangle becomes 171,2 mm: a variance of 0,7%. The geometric definition of the pommel varies in width and height to the measurements of the original by 0,1% and 0,2% respectively. In the case of D8801 from Søborg there is one further correlation between the geometric design and the physical sword that is curious. It has already been shown how two arcs cut the side of the square in the proportion of the golden section and thereby define the width of the blade. The same two arcs also coincide with the point of balance of the sword. This could well be a coincidence and not an intentional part of the design. 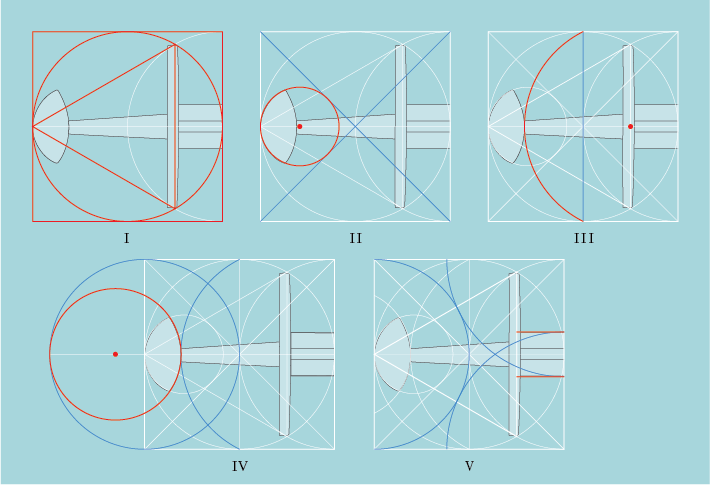 In the analysis of some 80 medieval swords, dynamic properties do sometimes coincide or hover close to the geometry that define their proportions, but the results are far from conclusive. Some aspect of the design of swords may well have been left to the knowledge and experience of the expert craftsmen who were involved in different stages of production. The blade smith did not have the expertise of the sword cutler or blade grinder, and vice versa. The organization of manufacture did probably vary in time and place but it seems reasonable that some sort of templates or specifications were used to make sure that all parts came together in the correct manner. Geometric drawing would have been a practical method to allow for a good level of precision without the help of written descriptions or standardized measurements. More about the practical use of geometry in design and how it may have helped the craftsmen of the period will be discussed in coming articles. In the year 2012 I developed the design for a limited series production of the Søborg sword to be made by Albion Armourers. The production version is very close not only in dimensions and proportions but also in dynamic properties. Please visit Albion Armourers or Albion-Europe for further information.